The former Dundalk star was outstanding against Brighton earlier. Horgan is a welcome addition at Deepdale. 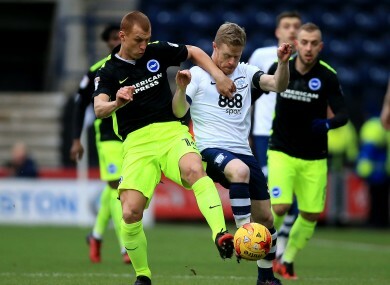 FORMER DUNDALK STAR Daryl Horgan had a dream starting debut for Preston North End earlier today as they toppled Championship leaders Brighton. The 24-year-old stepped up to the mark on his first start, putting in a solid performance and bagging an assist in the process. The 52nd minute of play saw Horgan play a fantastic ball over the top to set up Callum Robinson who made no mistake in finding the target. Preston fans appeared more than happy with their new signing, as he received a standing ovation when substituted in the closing minutes while others praised his efforts on social media. Speaking to Preston North End Player HD after the match, Horgan shared his delight at impacting the game, with his modesty shining through. To play the full 90 minutes is brilliant, but to also beat top of the table, comprehensively as well, is great,” he said. “Callum [Robinson] did brilliantly for his goal, Bruno is a very experienced player but he tucked it away to put us in a very strong position and thankfully we held off for the rest of the game. Maybe we could have had one or two more but we did well. Horgan came close to finding the back of the net himself in the second half. After a clever turn, he created a chance for himself but the resulting shot curled just wide of the goal. “That would have been brilliant to score, but ultimately it’s a great win for us and a clean sheet, it propels us further up the table and puts us in a stronger position to push for a play-off place. “It was never going to be easy against them [Brighton] with them being top of the table but thankfully we got the result and we can look ahead to Villa now. Meanwhile Grayson praised the Galway man on his first start following last week’s cameo from the bench. “I was very impressed with Daryl. I had no hesitation putting him into the team today given how he has trained and how he played last week for us,” he said. Email “Daryl Horgan shares his delight following impressive first Preston start”. Feedback on “Daryl Horgan shares his delight following impressive first Preston start”.